Owner's Mosquito Hook is perfect when using the down shot system for bass, walleye and panfish. For light line use, it is self-setting and perfect for windy conditions or turbulent water where it is difficult to keep a tight line. These hooks are ideal for rigging small live baits, for nose-hooking soft plastics, and for "wacky worming". 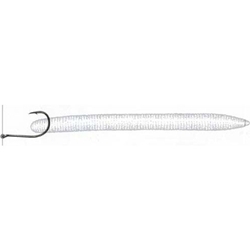 The Mosquito Hook features a fine-wire forged shank with offset Super Needle Point.